NHIDCL Recruitment 2019 - Job notification for 28 Dy General Manager Posts in NHIDCL, New Delhi on Deputation Basis. 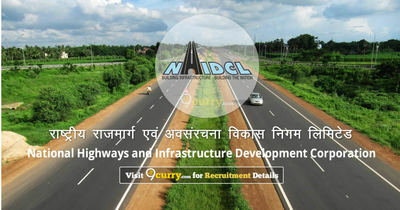 Applications are invited by National Highways & Infrastructure Development Corporation Limited on or before 15 Mar 2019 till 06:00 PM for 28 vacancies. Eligible candidates may send their application in prescribed format (attached below) to Director (A&F), National Highways & Infrastructure Development Corporation Limited, 3rd Floor, PTI Building, 4-Parliament Street, New Delhi - 110001 on or before 15 Mar 2019 06:00 PM, along with the relevant documents.